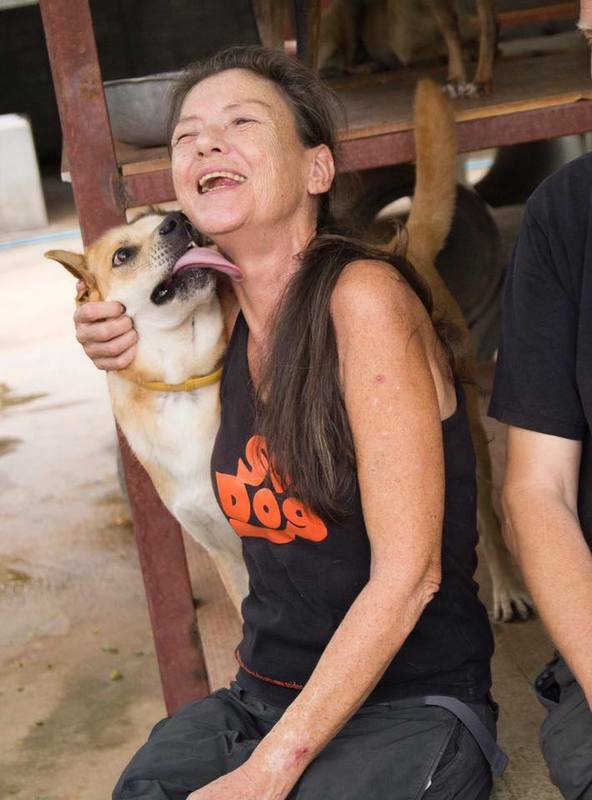 PHUKET: Gill Dalley, animal welfare pioneer and co-founder of the renowned Phuket-based Soi Dog Foundation, will be remembered with a celebration of her life this Saturday as part of the funeral services held to honour her passing. Gill Dalley in January 2005, less than three weeks after she discharged herself from hospital. Before that she counselled tsunami survivors in Takua Pa and Phuket. Gill Dalley happy with just one of the thousands of dogs she was responsible for rescuing and transforming over the years. 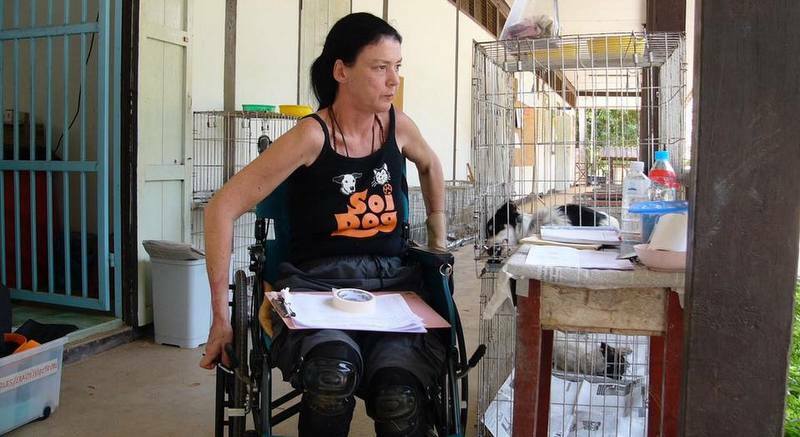 Gill Dalley, always a champion for the underdog whether an animal or a human. Ms Dalley died shortly after 1am Monday (Feb 13) at Bangkok Hospital Phuket. She was 58. Ms Dalley’s body will lie at her family home in Laguna until Saturday (Feb 18). “Friends and family are welcome to visit to pay their respects today, Thursday and Friday between 7pm 8:30pm,” The Phuket News was told this afternoon. “On Saturday morning the house will be open again to friends and family from 10am for a celebration of Gill’s life, followed by a brief prayer led by monks before Gill's body is taken to Wat Cherng Talay at midday. “There will be another short ceremony at the temple, followed by the cremation,” The Phuket News was told. Husband John, also Co-Founder of the Soi Dog Foundation, yesterday posted a letter to well-wishers. “I apologise for the lack of personal response but have been overwhelmed with condolences which give an indication of the regard with which she was held throughout the world. “She died in my arms peacefully after fighting to the end, as always, but this was always one battle too far even for her. “I do understand that there are people who would have liked to have said goodbye, but it was Gill’s wish that she be remembered as she was and not in her final days. 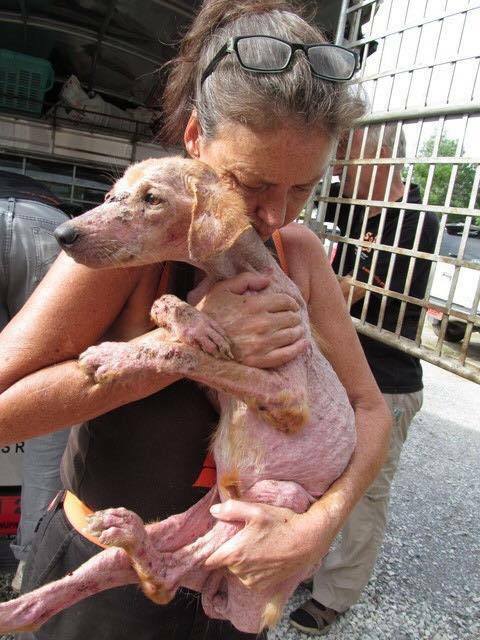 “It is absolutely no exaggeration to say that without Gill there would be no Soi Dog today. “When she lost her legs in 2004 I was fully prepared to end it then. Gill would have none of it. “I well remember her head doctor in Bangkok, who was a sikh, telling her that none of the medical team understood how she had survived, and he believed she must still have a purpose to fulfil. Gill’s response was; ‘I do’. “The current shelter, cat hospital and most recently the new dog hospital, were all designed and exist because of her, and were all built because of her desire to provide a refuge to animals who had nobody else to turn to. “A perfectionist, she was determined that the animals would have the best she could give them. She toiled night and day for 3 years to design and supervise the building of what is Asia’s largest and most modern hospital for dogs. “Another doctor back in 2004 told her that double amputees in Thailand rarely wear prosthetics because too difficult and painful to use. He also said to her I think you will be different. Once she had taught herself she told me to get rid of the wheelchair as would never use again. “Nobody was aware of the constant pain she suffered from her legs. Most of the time her stumps were covered in blisters and sores owing to the heat and humidity here not suiting the socks and liners amputees have to wear. The first is from January 2005 and taken less than three weeks after she discharged herself from hospital managing a mobile clinic after the tsunami. Prior to that she counselled survivors and relatives of the disaster in Takua Pa and Phuket. She never stopped for three months and put off learning to walk again to complete the mission. The second is my favourite, and shows her happy, with just one of the thousands of dogs she was responsible for rescuing and transforming over the years. The third is what drove her. She was always a champion for the underdog whether an animal or a human. This particular dog now lives on the Yorkshire Coast in the UK. One of around 50 a month that SDF now adopts from the shelter that SHE established. Thank you again for your kind words and thoughts.